The increasing nationwide popularity of residential trampolines and the rapid growth of indoor trampoline parks have resulted in a spate of injuries and litigation due to failures of proper supervision, faulty equipment and facilities, inadequate warnings, lack of professional standards and poorly qualified staff. Trampolines cause about 100,000 injuries every year and between 2001 and 2011, over 1 million people arrived in emergency rooms with injuries incurred while using trampolines, with nearly 300,000 including broken bones. Children make up the bulk of those reported injuries. Occasionally, a trampoline incident can lead to permanent neurological damage, while strains, contusions and sprains are the most common injuries. Three-quarters of trampoline injuries occur in multiple jumper situations. Small children are most likely to suffer injuries when several people share a trampoline surface and about 20 percent of trampoline spinal cord injuries happen when jumpers collide as they attempt stunts or fall from the jumping surface. Young children constitute up to 37 percent of patients evaluated in emergency rooms after trampoline accidents. Approximately 15 percent of trampoline injuries happen to children under the age of six. Research has found that young children have the highest risk of serious injury, including spine and leg fractures. Since 1981, Dr. Rabinoff has been actively involved in sports liability and its impact on the profession of human performance, sports and leisure studies. He has written books and articles in numerous national publications and has appeared at national conferences on sport management and coaching, speaking on safety, product liability and the implementation of proper coaching methods. Dr. Rabinoff has over 42 years of experience teaching and coaching in higher education and is currently Professor Emeritus of Human Performance and Sport at Metropolitan State University of Denver, and he is a welcome addition to the ATA team. ATA Associates is pleased to announce the addition of Dan Allen to their stable of contributing experts and consultants. Mr. Allen is concluding a 29-year stint with J.B. Hunt Transport Inc., serving the bulk of that time as safety director with additional concentrations in driver training and driver management. Previous to that, Dan was an owner/operator, with over a decade of experience on the road as a driver. Mr. Allen stated that his decision to move on from his most recent position with one of the country's largest trucking companies was "because I was very interested in working with companies and individuals who could possibly use my expertise and some of my knowledge to help promote safety for their company and for the public at large." Dan looks forward to building on his 35 plus years of transportation experience in order to become a valuable asset for clients needing direction or assistance in how they manage vehicle and driver safety. Dan states that "Growi presentations of subjects of particular interest to any group. As the use of drones and technology surrounding them continues to develop, ATA is keeping at the front of the curve. We are now incorporating drone-supplied mosaic imagery as an important part of our accident site investigations. These tiled mosaic images only keep relevant image data in rendering a true-to-life scalable site image. The expert need only import this imagery into AutoCad, and the site measurements are ready for review without any manual input from the user. In our next issue, we will feature a more in-depth discussion of the use of drone technology in our forensic investigations and the how that can help the investigating expert. This issue, we feature one of our favorite and most valuable tools. Our FARO 3D scanner can be taken out in the field to “shoot” incident vehicles, sites and buildings in a quick, efficient fashion. The resulting digital point clouds are imported into graphics software that can be integrated with Google Earth imagery, GPS data and other types of data to produce 3D-based imagery and videos. We have had great success utilizing this combination of 3D scan data and Reality animation software, receiving extremely positive reviews from our clients. This “drawer” in our Toolbox discusses the process involved and showcases plenty of examples used in actual cases. 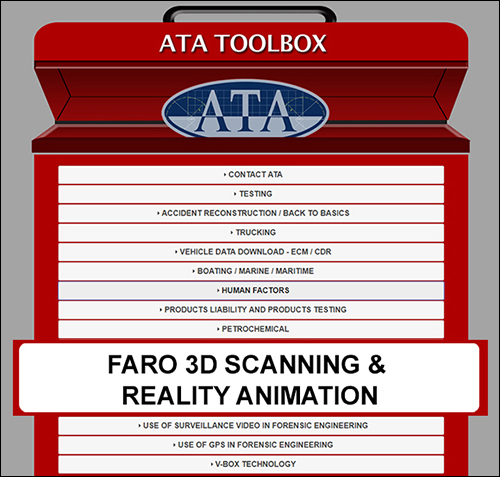 Visit the Toolbox and click on the “FARO 3D Scanning & Reality Animation” tab to view presentations on this important investigative topic.